For Windows users, please read carefully the text below, before trying V9. Caution: once your dmx interface is declared with the new usb drivers "2018_...", V8 will not find it. 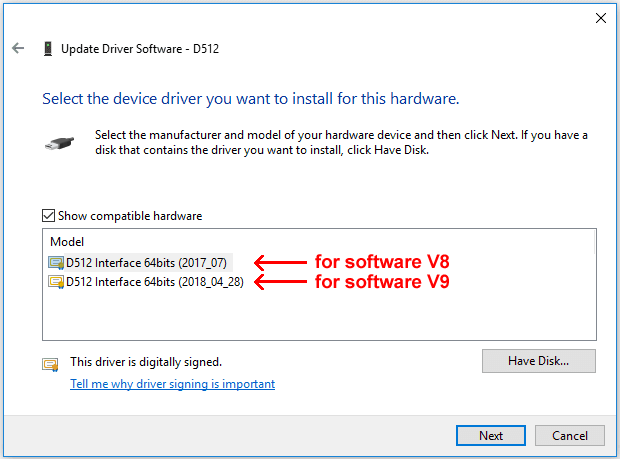 In order V8 finds again your usb interface, you have to select back the driver "2017_07" in the Operating System driver properties window. Please note that the V9 software install process will not make any change in your existing usb drivers. Windows: Windows XP & Vista do not support the usb drivers for V9. However the software works (without interfaces) with these two OS. MacOS: there is no 32bits version of V9 for MacOS (MacOS is 64bits only for years). New fix file for V9.1.2 . Option "not used in Lightshow Creator" for groups. Lightshow Creator - "shift slider" in Generator buttons in tab "Live"
Pixels - menu "Delete fixture"
Live - option "Hide BPM section"
Problem fixed, with old Windows versions (Windows 7 and older), when using the "page" dropdown list in tab Live.